The Suppressed Frame system of telerecording was developed by the Research Dept, of the BBC Engineering Division, to be installed at Alexandra Palace in readiness for the Coronation of June 1953. On 9th October of that year, C.B.B. Wood, Head of the Research Dept gave a lecture on its development to the Television Society, and which was published in the Society's Journal in December. The problems involved in the design of apparatus for recording television programmes are largely ones of compromise, and they are greatly complicated by the fact that there are several different television standards in use throughout the world. One of the chief uses of telerecording is to facilitate the international exchange of programme material and it is therefore important that any telerecording should be capable of being reproduced by television standards other than those of the original programme. In meeting this requirement, the designer has no clear and obvious choice of approach, since every system of telerecording so far used or proposed involves the acceptance of some undesirable features which are fundamental, and the interest of this work lies in achieving a system which combines reliability with the minimum degradation of the original programme. There are two fundamentally different approaches to the problem of television recording. One is to record the transmitted vision waveform so that it can be stored and transmitted again at a later date, the whole process being purely an electrical transaction. The other approach may be termed picture recording, and in this case the aim is to produce a recording on standard motion picture film which conforms to normal motion picture standards and may be treated in all respects as though it had been made with a cine camera. That is to say the film may be inspected frame by frame, edited, optically projected by a standard machine, and transmitted as a television programme through the telecine channel in the same way that feature films and newsreels are transmitted. It will be realized at once that any pure waveform recording can only be retransmitted by a television system having the same standards of frame frequency and number of lines per picture as the system which originated the programme. For example, a 405-line waveform recording could not be replayed at any other standard than 405 lines. However, using a system of picture recording in which the original line structure has been obliterated by the use of spot wobble on the display tube, there is nothing to prevent, say, a 405-line recording from being transmitted over systems using a different number of lines, for example, 525 as in North America or 625 on the Continent. Picture recordings are therefore internationally exchangeable whereas waveform recordings are not: similarly picture recordings are made compatible with the cinema and the apparatus used for televising motion-picture films is also suitable for replaying such recordings. Conversely, television recordings made in this way may, if desired, be shown in a normal cinema. Unfortunately, every picture recording system introduces one or more undesirable effects which are noticeable upon reproduction of the film, and only a waveform recording can give completely accurate representation of the original television programme. Nevertheless the desire for the recorded television programme to be in the form of a standard motion-picture film has so far outweighed other considerations, and only this type of television recording is found in general use. It is possible that in the future, broadcasting authorities may find it useful to operate two systems of telerecording, one a picture-recording system for international exchange and the other a waveform-recording system of some type yet to be developed for high quality repeat programmes within their own networks. His words at the actual lecture were: "We sail very near the wind in television". In this country the transmitted television signal comprises briefly, frequencies within a spectrum from D.C. to 3 Mc/s as picture and synchronizing information, together with unwanted random noise whose R.M.S. value is, say, 30db below the level of peak white signal. 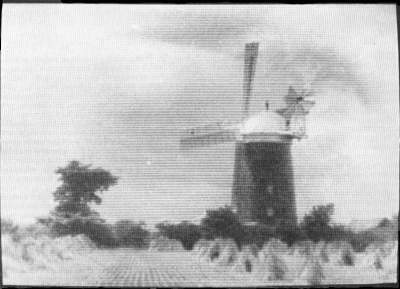 During the past few years there has been a steady improvement in the signal to noise ratio of television pictures, but it is still essential that any recording system should not in itself contribute greatly to the noise; that is to say, the signal to noise ratio of the reproduced recording must not be appreciably worse than that of the original programme, since the margin for an acceptable picture quality is still very small*. The need to record frequencies up to 3 Mc/s with a good signal to noise ratio very much restricts the choice of a recording medium. Clearly the ordinary gramophone disc would be unsuccessful, and although attempts are being made to record television waveforms on magnetic tape, there is as yet no news of any great success. The basic difficulty here is fairly obvious, since even with the smallest practical aperture on the magnetic recording head, the area of magnetic material used in recording signals up to 3 Mc/s would at present be uneconomically large. The use of photographic film for sound recording is of course well known and it is this medium which has so far been used for television recording. The choice perhaps seems more obvious if the process is considered merely as the cinematography of a television picture displayed on a cathode ray tube, but it must be emphasized that such recordings are fundamentally variable-density recordings of the television waveform. The manner in which a television picture is built up, point by point, line by line and scan by scan means that the photographic film used to record television will also be exposed in this fashion, and it will be noted that it is merely because a variable density track has been drawn on the film in a suitable manner that the recording takes the form of a series of recognizable images. It will also be noticed that one of the most economic means of recording the maximum length of variable-density track on a given footage of standard motion-picture film is to lay the track in closely spaced parallel lines across the width of the film. Under these conditions the recording spot is tracing across the surface of a 35 mm. film at about 10,000 inches a second as against 18 inches a second for the normal sound track and it is of course this 500 to 600 times greater speed that permits frequencies of 3 Mc/s to be recorded. A high frequency "wobble" of the spot as it traces the raster may be used to broaden the lines until they merge together and produce a smooth background. The first step in dealing with the design of a picture recording system (which basically will comprise a cathode ray tube and some form of cine camera) must be a consideration of the repetition rates of the television picture and of the film. The standard frame repetition rate for motion picture film is 24 per second, while in this country the television frame frequency at 50 per second interlaced gives 25 complete pictures per second. It is the practice in this country to ignore the small departure from motion-picture standards and to make the film recording at 25 frames per second which then gives a simple relationship - two television scans, making one complete 405-line picture, per frame of film. If it were not for the very short interval between the end of one television scan and the beginning of the next, it would be a simple matter to record two scans at a single exposure of a film frame then pull down the film in the camera and expose to the next two scans and so on. Unfortunately, the suppression period between television scans is only 1.4 milliseconds and pulldown of the film in this very short interval represents a difficult problem. There are some 16 mm quick-pulldown cameras, but there is not yet available a 35 mm camera capable of this performance over long periods. In the absence of such a camera the attention of designers has turned to other means of arranging that each frame of film receives its exposure from two consecutive scans. As an alternative to quick pulldown of the film, many ingenious suggestions have been made which as a rule aim to bring about a quick displacement of the image by causing it to move at the critical moment from one film frame to the next while the film is moving steadily and continuously through the camera gate.